If you can’t remember what happened in Three Dark Crowns, then check out our summary below! To refresh your memory on what happened in the rest of the series, we’ve also got recaps for those. The three queens are triplets who were separated as children and raised by different groups of people based on their powers. Once they turn sixteen, they’re expected to try to kill each other in order to get the crown and become queen, only for the whole cycle to begin again when the queen has triplets. Katharine and Arsinoe are a bit rubbish at using their powers, so everyone expects Mirabella to become queen, only she doesn’t want to kill her sisters. Joseph is a prat and sleeps with Mirabella even though he’s supposed to want to marry Jules. At the ceremony where the sisters present their powers, Jules loses control of the bear that is meant to be Arsinoe’s familiar and it goes after Mirabella. Mirabella is offended and changes her mind about killing her sisters. Pietyr shoves Katharine into a ditch (the Breccia Domain… it’s actually really deep) to “save” her. She shows up at the end a bit dishevelled. Arsinoe discovers that she is actually a poisoner and a mistake has been made. 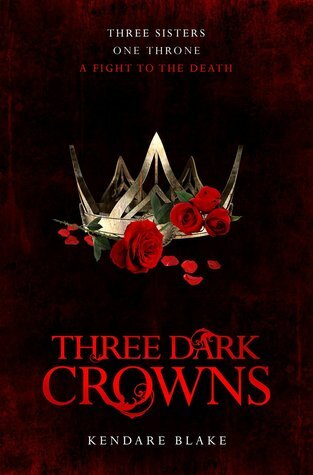 what happened in Three Dark Crowns? First we meet Katharine, the poisoner queen. It’s her sixteenth birthday, and she has to prove her skill by eating poisoned food. Except she’s not very good at it, and is very weak. Katharine dances with Pietyr, Natalia’s nephew. The feast begins. Katharine can’t handle the poison and vomits. No one will help her so she lies on the floor. Next is Arsinoe, who is a naturalist. She doesn’t have a familiar like the other naturalists her age. Her best friend, Jules, has an awesome mountain cat called Camden. Only one council representative attends Arsinoe’s birthday. Jules and Arsinoe learn that Joseph is on his way back to the island. Joseph was banished from the island when they were all younger because he was trying to help Arsinoe escape. Jules wasn’t punished because her aunt took her punishment for her. Finally, we meet Mirabella, the elemental. She’s expected to become the queen because she’s the strongest. Except she doesn’t want to hurt her sisters. Pietyr plans to make Katharine more beautiful and desirable so it’ll make people like her. In exchange for this, Pietyr wants to be put on the Black Council. Joseph introduces Jules and Arsinoe to his foster brother, Billy. Madrigal, Jules’ mother, wants Arsinoe to help her with a love spell for Jules and Joseph. Arsinoe agrees to help at first but then feels guilty so she throws everything into the fire. Mirabella meets Elizabeth, a priestess who was originally a naturalist. She has a secret familiar. Elizabeth tells Mira that Rho wanted a girl to sacrifice herself for Mirabella. Mira isn’t exactly shocked. Rho and Luca speak about Mirabella. They don’t think Mira is mentally strong enough for what lies ahead. Mira goes to the market with Bree, Sara, and Elizabeth. They hear about a potential suitor turning up at Wolf Spring with Joseph. Katharine is told to poison a man who has been imprisoned for murder. She sits with him while he drinks poisoned wine. Jules and Joseph get engaged. Billy and Arsinoe bond a little bit. Jules and Joseph confess their love for one another. Rho plans to make up some stories about the queens. She wants Mirabella to become a White-Handed Queen – one who doesn’t kill. Rho plans to have the other sisters sacrificed at Beltane. Natalia returns Katharine’s lost snake to her, since she lost it during the feast. Natalia tells Pietyr that this isn’t the original snake, because that one is dead. Pietyr protects Katharine when the snake tries to bite her. Joseph plans to leave for a couple of days to go back to the mainland. Jules doesn’t go with him because she wants to stay with Arsinoe. Mirabella decides she has to leave. Bree and Elizabeth help disguise her as a priestess so she can leave the city. Madrigal takes some of Arsinoe’s blood for future spells. Jules is furious. Mira saves a washed up sailor, whose boat capsized during a storm. The sailor turns out to be Joseph, and the pair end up sleeping together. Jules and Arsinoe go looking for Joseph. Arsinoe sees Mirabella hiding. She wants to talk to her, but Rho arrives. Rho takes Mirabella back home. Luca tells Sara about the White-Handed Queen idea. Katharine meets Billy and kisses him. Joseph tells Jules what he did. Elizabeth’s hand is cut off for helping Mirabella escape. Arsinoe dreams of a bear, which might have something to do with Madrigal’s spell. Arsinoe takes Jules, Billy, and Joseph with her to find the bear, which could be her familiar. A bear does arrive, but it attacks. Arsinoe and Camden are injured. Jules kills the bear. Billy’s father, William, meets with the poisoners. He tells them that the priestesses are planning on killing the other queens. Pietyr admits he loves Katherine. Billy tells Arsinoe about the sacrifice. Billy offers to take her to the mainland. Katharine and Mirabella go to their separate encampments for Beltane. Pietyr takes Katharine to the Breccia Domain, which is where they throw the sisters who don’t become queens. Katharine finds it really interesting. Jules and Joseph get separated during the hunt. Mirabella finds Joseph and kisses him. Natalia tells Katharine that her food won’t contain poison so she can eat and impress everyone. Jules finds out her mother has been sleeping with Matthew – her aunt Caragh’s ex. Needless to say, Jules is fuming. Arsinoe is caught and put on trial. Mirabella starts up a storm to help Arsinoe escape. Arsinoe tells Jules and co. about the planned sacrifice. They plan to bond Arsinoe to a bear using magic so the people will think she’s strong and therefore won’t want to execute her. Jules plans on controlling the bear for her. A bunch of suitors arrive from the mainland and the queens greet them. Billy is the only one who bows properly to Arsinoe, and he also only bows to her. Knives are delivered to Luca and Rho. Jules and Joseph ask Billy to join them but he can’t choose a side at the moment. Jules wants to sleep with Joseph but he doesn’t want to. Katharine promises to meet Pietyr at the Breccia Domain if anything goes wrong. Bree, Elizabeth, and Mirabella think the priestesses are acting weird. Madrigal lets slip that she was with Matthew and Arsinoe is disgusted. She helps link Arsinoe to the bear using low magic. Katharine and Arsinoe do well at their demonstrations. Jules notices Joseph staring at Mirabella as she demonstrates her power, and Jules loses control of the bear. It runs for Mirabella but Jules stops it just in time. It does kill a bunch of other people though. Katharine goes missing during the chaos. Katharine goes to find Pietyr, who pushes her into the Breccia Domain. Search parties are sent to look for her but she isn’t found. Mirabella is offended and upset that Arsinoe attacked her with the bear. Katharine arrives home wanting revenge. Billy brings chocolates to Arsinoe. Jules eats one and is poisoned. She lives, though. Arsinoe admits that she ate some of the chocolates and they didn’t affect her, which means she’s actually a poisoner. And that’s what happened in Three Dark Crowns by Kendare Blake! If you need help remembering what happened in any other of your favourite book series, check out our recap list.